Travis Lewis, a seventh-round draft pick in 2012 who played exclusively on special teams this season, was suspended in early December by the NFL. 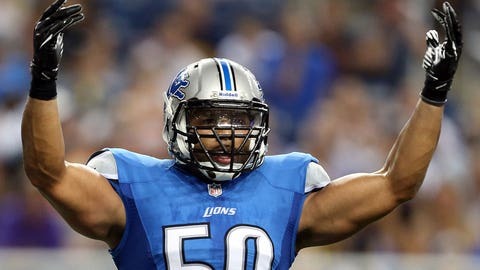 ALLEN PARK, Mich. — Travis Lewis returned Monday from his four-game suspension just in time to clean out his locker for the off-season and watch former Detroit Lions coach Jim Schwartz give his going-away speech to the team. Lewis, a seventh-round draft pick in 2012 who played exclusively on special teams this season, was suspended in early December by the NFL. Lewis said he mistakenly took Adderall, which can be used to sharpen focus and improve reaction time. It’s considered a performance-enhancing drug by the league. "I took a substance that shouldn’t have been in my body," said Lewis, a linebacker who led Oklahoma in tackles all four years in college. "It was a bad situation. Bad on my part. I paid for it. Big-time mistake. Big big-time mistake. "I wasn’t aware of what was taken. I thought I was taking caffeine pills. Unfortunately it falls under the performance-enhancing drug act. "Don’t ever trust a friend that gives you something like that. It goes out to the kids. Don’t just take something someone gives you and says it’s one thing and it ends up being another." As for the friend, Lewis said, "Definitely a former friend who cost me a lot of money and games that I’ll never be able to get back." Lewis lost more than $100,000 in game checks during the suspension. He said it was the first time he’s failed a drug test "in my entire life." "They informed two or three weeks before the suspension came down," Lewis said. "I was scrambling to figure out what it actually was and what it did. "I think I got tested three or four times after that. Passed all of them, passed the reinstatement test." Lewis said he learned a lesson. "I’ll be way more cautious of it," he said. "Way, way more cautious of it." Lewis added: "I’m ready to get back to playing football." It’s a little late for that. The Lions’ season is over. 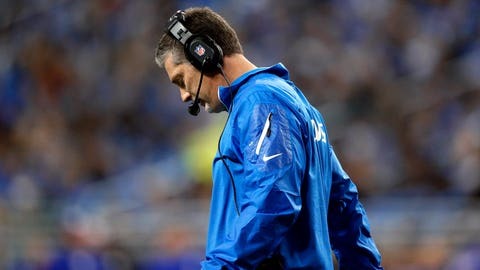 They lost six of their final seven games, which got Schwartz fired Monday, a day after the regular season ended. Lewis seemed genuinely upset about losing his coach. "Coach Schwartz was my guy," he said. "I loved him." Lewis described a much different side of Schwartz than the media and fans observed over the last five years. "He’s the most down-to-Earth, just a great person," Lewis said. "I know he gives a different impression from the media standpoint. The media doesn’t see when he calls you up to sit you aside and just wants to know how you’re doing, how your family’s doing, how are you doing as an individual? "You don’t get that in a lot of guys (coaches). A lot of guys, you’re just a player to them. You’re here for one year, here for the next. "Coach Schwartz actually takes the time to get to know you. He wants to know his players, how they’re doing, what the mood of the team is and everything. He’s always great at doing that." Now he’s gone, just when Lewis is back. Add former Oakland Raiders coach Tom Cable to the list of potential candidates to replace Schwartz, according to the Detroit Free Press. Cable had a 17-27 record as the Raiders’ coach before being let go following an 8-8 season in 2010. He is in his third year as Seattle’s offensive line coach and assistant head coach.